Bella is 9 month old today.. Hooray!! And she got 6 teeth!! Only God knows how much she loves to bite!! Hahhaha… I’ve been trying to teach her how to brush her teeth since she had her first tooth *obsessive mommy mode* We started with this one.. Thumb in one pocket, and middle finger in one pocket.. It’s not easy to use this at first but after a while, I got used to it.. Then my mom told me to buy ‘real’ toothbrush for baby.. When Bella is getting better at holding something (and shoving things into her mouth! 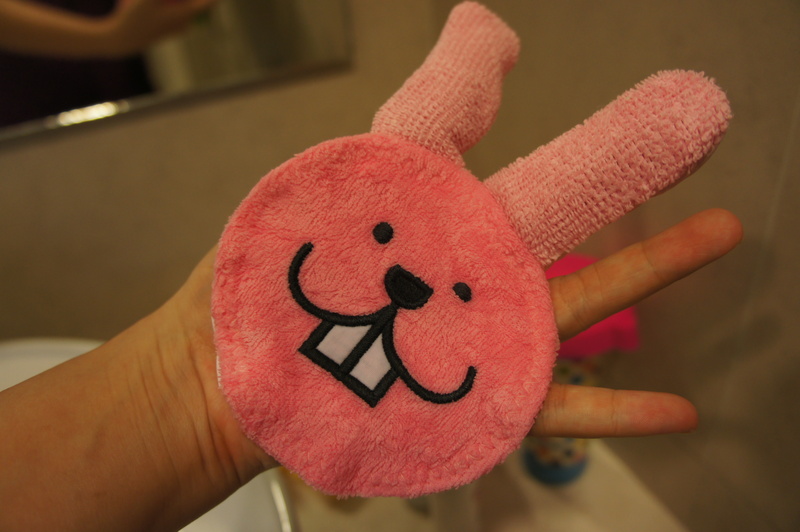 ), we bought this one.. 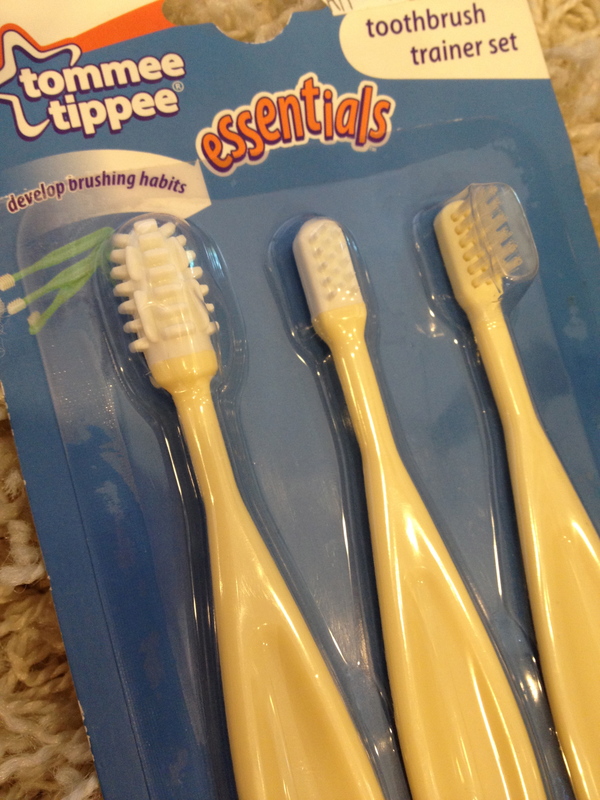 It comes with set three toothbrushes, the most left is for beginner where usually baby loves to bite and chew whatever things they are holding.. Bella loves to chew this one as compared to the second one.. and the third one is for real brushing works.. I usually let her chew her toothbrush while she’s playing and during her bath time.. and only use the third (real) toothbrush before she goes to sleep. Im just trying to make it a habit for her to brush her teeth at night (even I know she’ll drink milk until she falls asleep :D) and if you’re wondering, no, I don’t put toothpaste on the toothbrush! Posted on April 21, 2012 January 1, 2014 by Dr Halina Mohd YunosPosted in MommyhoodTagged first. Previous Previous post: Beef Casserole and Butternut Squash for Little B!! Next Next post: What Type of Mommy Are You? U r such a good mommy doc….obsessive in a good way…masyaAllah….mungkin doc boleh bg bella dgr ayat 2 quran pulak…:) n ajar dy sebut Allah..hehehe..i see a lot of mommies do that…. Nanti i cari babe.. Thanks!! Hi , the brand is ‘First Teeth’ kalau c silapnya. Its Milk enzymes + banana & apple. RM 25 a tube. Only available at Guardian and selalu ader under the hanging toothbrushes shelves! Fluoride free too! i dulu mula2 beli yg lembut tu..tp lupa nama..brand 1st doctor ke tak sure sgt..then i tukar MAM..1pek tu ada 2pcs..satu yg pendek n satu yg pjg..so, masa ajar dia berus gigi, kira pegang sorang satu la..lps tu memandangkn my baby sgt sukar utk diberus gigi, i tukar ke oral B yg electronic punya..hihihi..i pakai ubat gigi jenama first teeth..safe to swallow tapi i guna lps my baby 1y+++..
Electronic toothbrush for baby? Awak lagi obsessive dr saya!! Hahaha..
Muke die cheeky gile..comel anak dara ni..my son br 2bln.haishhh..tau gelak2 n sembang2 j..rambut pon skit j..tp berat!! !aritu p cucuk 2bln,6.5kg already..;) salam utk cik bella..
Hey hi doctor 🙂 just wanna let you know that I’m 17 but then love love love to read bout your baby’s progress. Such an amazing blog! You make me wanna hv my own baby bfr I turned 20! Oopss! rupanya ada berus yang macam ni, saya pikir cuma jenis yang sarung dalam jari tu aje.. I used to use the rubber thumb thingy for my baby. Ala lupa plak brand apa. But it supposed to clean the tongue too to la. Ada org guna that tooth tissue too. Spiffies is the brand. This blog is abt my journey on becoming a mommy, my dear.. I learn new things a long the way by sharing experience with others 🙂 glad you like it! Hi doc.. Try and get the GC tooth mousse for Bella. It is pretty good. I’ve been using it on my daughter twice daily for a month now. It was recommended by dentist and few other mommy friends of mine. Apparently it is like calcium for their teeth and makes them stronger. Good for teething babies too. Problem is it is so difficult to find. I had to buy it online as on their website, most of the stockists are either in Penang or Sabah. i started to introduce toothpaste to my daughter when she is 1, every baby/toddler tend to swallow everything that gets into their mouth so i use Pureen toothpaste since the ingredient don’t have active fluoride, which is not good for the baby. salam dr halina..interesting blog! ur Bella is 2 month younger than my Atirah. my atirah also got 6 tooth at her 11 month old. i just buy silicon brush from Pureen..after reading this, i will find the real brush for atirah la..
suka baca crita tentang bella…. oh..really fall in love with ur journey =) adorable ! hm…i wonder,mcm mane nk berus gg die sblm tdo? saya biasenyer berus gg die mase mndi pagi dan petang. itu je masa yg saya ade anyway.. what should i do? Not exactly before tido.. Just before I susukan dia to sleep.. Make it a habit for her.. I love all the story about baby Bella..doc…congratulation to both of you!